Safety Island™: Ideal for either the bathroom or the kitchen, this accessory's circle handle design with solid center not only proves to be phenomenally beneficial as a standing device, but also as a traditional kitchen island. Upon grabbing hold of the circular handle, items can be placed on the solid center. This frees your hands for better use-such as keeping your balance. Easily attaches to the SuperPole™. 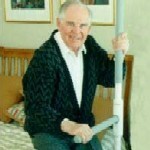 For optimum use of the safety island the SuperPole™ should be placed in a central location in the room. Easy Installation: The Safety Island™ is mounted to the SuperPole™ at virtually any height. 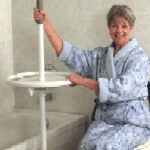 Ring & tray do not spin freely around the pole, providing fixed support. 360 degrees of Support: Effective ring design allows continuous support - ideal for those who suffer from weak gripping strength. 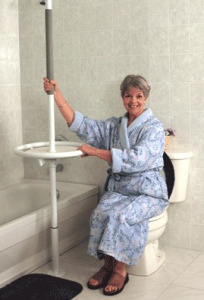 SuperPole Benefits: All the benefits of the floor-to-ceiling vertical SuperPole™ - a sturdy transfer pole that can be installed in virtually any location - the kitchen, the bathroom, or the bedroom! Easily installed in minutes with basic tools by simple jackscrew expansion. 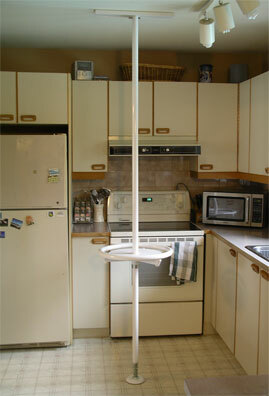 This creates a tension fit between floor and ceiling. Stylish: Clean, modern design blends in with your home decor. 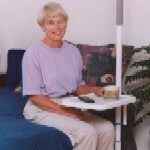 Convenient: Easy to clean tray can be accessed from around the pole. 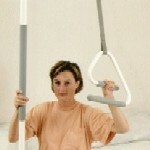 Tubular Ring: Typically 28-38"/71-97cm from floor, 18"/46cm diameter, 1.25"/3.175cm diameter tube for easy gripping. Tray: 14"/36cm diameter A.B.S. tray, easy to wipe clean.